The Acura RLX is available in 3.5-liter 310 hp V6 form with a 6-speed automatic transmission and front-wheel drive or as a 377 hp hybrid which adds 3 electric motors a 7 –speed dual clutch transmission and all-wheel drive. Both models are smooth and sufficiently powerful. The RLXs offer a high level of equipment with items such as power seats, leather interior, collision and lane departure mitigation all fitted as standard. Although the interior design is uninspiring the quality of the fittings is of a high standard and passenger space is commendable. 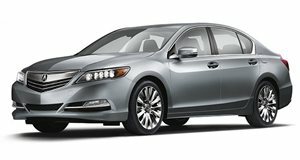 The RLX sits at the top of the Acura sedan model range and since its introduction in 2014 has been a luxurious and well-specced alternative to the usual suspects in this competitive category. For 2017 the base trim level has been dropped along with some minor trim changes. 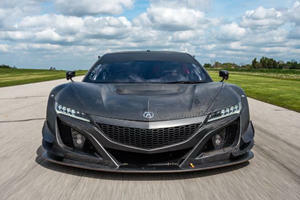 The Acura suffers from a nondescript exterior design and this extends into the cabin too. The quality of the materials is of a high standard but the dashboard layout, switchgear and general ambience does not match the more modern design aesthetics of its rivals. Passenger space is excellent both in the front and rear, the seats are not the best in the business though and do not offer enough lateral support in corners or enough padding for longer trips. The trunk space is also slightly below average for the class but adequate for most needs. The Acura is a competent handler, tackling challenging roads in a generally unflustered manner. It does not exhibit the kind of cornering talent its German rivals offer but unless this is a top priority for you the RLX feels safe and planted in most driving situations. The Sport Hybrid adds all-wheel drive and extra power into the mix which improves the handling in slippery situations. Save for some road noise from the standard 19-inch wheels, the smooth drivetrain and hushed cabin make for a relaxed atmosphere. Those 19-inch alloys also tend to keep the ride on the firm side although it is acceptable for a luxury sport sedan. The RLX is offered with two drivetrain options. 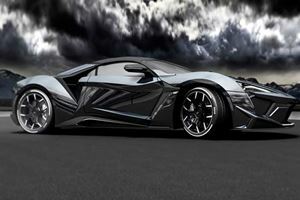 The first is a 3.5-liter V6 which produces 310 hp and 272 lb ft of torque. Power is sent to the front wheels through a smooth-shifting 6-speed automatic transmission. Acceleration is strong throughout the rev-range and even though the RLX does not set any new performance standards in its class it is still quick with a 0-60 mph time in the low 6-second range. Fuel economy is also middle of the pack although the second drivetrain option offers much improved consumption figures, especially if you do a lot of city driving. The RLX Sport Hybrid adds 3 electric motors to the base V6 to produce a combined 377 hp along with 347 lb ft of torque. A 7-speed dual-clutch transmission replaces the 6-speed automatic and thanks to 2 of those electric motors powering the rear wheels, the Sport Hybrid is all-wheel drive too. The electric motors cut in and out imperceptibly and overall performance is improved over the standard RLX. While highway mpg remains unchanged at 30 for both models, the hybrid model is potentially far less thirsty around town where it offers 29 mpg versus 20 for the base RLX. 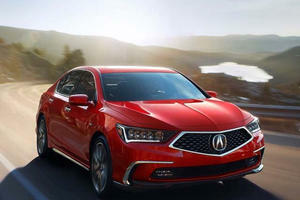 The Acura RLX has dropped the lowest level trim from last year so the Technology Package inherits that tag and the Advance Package remains as the top trim level. Both RLX and RLX Sport Hybrid are available with the same trim and equipment levels with one exception being a standard head-up display in the hybrid cars. The Technology trim makes the base RLX a very well-equipped car. Keyless ignition, sunroof, powered and heated front seats, 19-inch alloys and leather upholstery are all standard. A rearview camera and audio system with Bluetooth, smartphone integration, USB connectivity and satellite radio are also included. Safety systems are a strong point in the RLX range with the standard AcuraWatch incorporating driver assistance features such as lane assist, road departure mitigation, blind spot monitoring, adaptive cruise control and collision mitigation braking system. The Advance package offers a Krell 14-speaker audio system, Ventilated front seats, heated rear seats and steering wheel, power rear sunshade, manual rear side shades, surround-view camera system and all-round parking sensors. Individual options such as a remote start engine system, woodgrain trim, engine block heater and cargo net are also available. With minor changes taking place in 2017, the RLX remains a spacious, well-equipped and very safe luxury sedan vehicle. It may not offer the design flair or overt sportiness of some rivals but it offers a smooth and unflustered drive and the hybrid version adds praiseworthy fuel economy too. And it looks like it’s deserving of it. The RLX gains tech and an attractive new nose ahead of a Pebble Beach reveal.